Voice your opinion! Review The Works Stores now. The Festive Season is just around the corner and everyone must be looking for some nice gifts and so does I. The only problem about this happening period is that, the products are quite expensive during this time of the year. 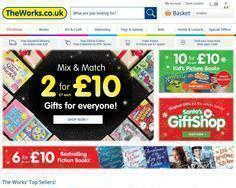 But The Works UK are having some great offers and discounts on gift products. There are many gift options available, especially for kids. Recently, I bought Magical Unicorn Activity Chest and Paint Your Own Roaring Stomping Dinosaurs for Halloween from https://www.theworks.co.uk/c/multibuys/2-for-10/christmas-gifts. I am also planning to buy my Christmas gifts from the works in the coming week as they are having this superb limited period offer. The football world cup has already begun in the Russia. I always love watching football games with my close friends and family. Cheering together, shouting, bantering and standing behind your team even when you are at home is the best thing to do. I ordered England Party Set and White England Balloons from https://www.theworks.co.uk/c/we-love/england-party-supplies . The delivery was real quick and packing was great. Enjoying three lions’ game with proper home décor is super fun. The Works is the best place in town to go for family shopping. Is The Works Stores your company? The Works offers huge savings of up to 80% on books, toys, DVDs, stationery, art & craft supplies, gifts & more. Shop online at Britain's top family friendly discount store!